How to pick your robot best friend. 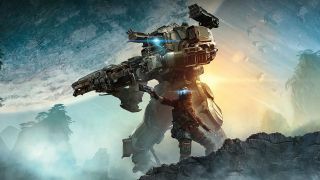 We recently went over the best guns in Titanfall 2, but racking up kills means nothing if you can’t pilot a titan. As you might expect, controlling a pilot and controlling a titan require a completely separate set of skills, and learning the intricacies of each mechanised behemoth can be rather daunting. In the hands of an inexperienced player a titan can be destroyed in a matter of seconds, but with a little practise you can run circles around your enemies. To help you deliver as much carnage as possible, we’ve put together some tips to help you learn the intricacies of controlling your titan, and a few helpful strategies that will have you well on your way to earning your pilot's license. Ronin is the hardest titan to play optimally. His lightweight chassis allows him to outmanoeuvre all other titans aside from Northstar, while his Leadwall shotgun can make short work of an enemy titan’s shield and battery. However, Ronin’s durability is one of the weakest in the game and is extremely susceptible to sustained damage and barrage fire from Legion, Scorch and Tone. This fragility can lead to Ronin being doomed within mere seconds and is extremely frustrating when you’ve only just entered the cockpit. You can avoid this by quickly farming up grunt and pilot kills in the early game, as this will allow you to drop your Ronin into the action without any resistance from enemy titans. Once you’re safely seated inside your mechanised behemoth it’s time to do some pilot hunting. Use your speed to rush enemy pilots and simply pick them off with your Leadwall Shotgun. Leave the grunts and spectres to your team so they can farm up points and launch their own titans into battle. If you use Ronin in this way you will stop the enemy team from calling in their titans, greatly diminishing their effectiveness on the battlefield. If enemy titans start to trickle in simply flank them, unload a few shotgun shells into their backs, and retreat before they have a chance to react. Phase Dash will also allow you to teleport behind them once again and can be an absolute nightmare when combined with Arc Wave, as this will slow their turning speed and give you time to retreat, or deal the extra damage needed to finish off an enemy titan. Scorch is great at forcing enemies out of cover and controlling areas of the map. His five bars of health allow him endure a lot of damage before being reduced to a doomed state, making Scorch an excellent tank that can be used to push objectives, or sponge incoming damage. However, Scorch is best used in tactical situations. The Thermite Launcher deals damage over time and will burn enemy titans if they walk over its area of effect. The Thermite Launcher can be a bit tricky to use at first, as you must learn to lead your shots and aim where you think the enemy will be moving. Try to force your opponent into areas where their mobility is greatly reduced. Once enclosed, fire your Incendiary trap behind them so their escape is sealed off. You can use your Thermite Launcher and Heat Shield to burn through their armour and help coax them into position. When they start to retreat simply ignite the trap with Scorches weaponry and watch the fireworks. However, if you want to deal maximum damage wait till you have your Flame Core ability available and try to catch multiple titans in your Incendiary Traps. Once as many titans have been lured into position, ignite the traps with your Flame Core and watch the explosive chaos unfold. Northstar dominates her opponents with her precision attacks, cluster missiles and high mobility. Her main source of damage comes from her Plasma Railgun, which can be charged by looking down the sights. Once fully charged, the Plasma Railgun can unleash huge amounts of damage and can make short work of enemy titans if you hit their weak points. Keep your Railgun charged at all times and use your two dashes liberally, so that you can reposition yourself when the opportunity calls. Make sure you’re always behind cover when you fire, as this will allow you to quickly dart to safety and give you time to charge your next shot. Try firing through small areas of cover to minimise your chances of being spotted and help mask your general location. Peeking behind cover will greatly increase your survivability and stop enemy titans from being able to lay down accurate fire on your position. Your Viper Thrusters are best used for when you want to finish off a fleeing titan, or reach more advantageous positions. After all, hovering in the sky with such a fragile titan is a recipe for disaster and has led to many Northstar deaths in the field. If you manage to catch an enemy titan in your Tether Trap use your Flight Core and your Railgun to barrage their weak points. The restricted movement applied from the traps will make it hard for them to avoid the incoming damage, often giving you the chance to either flee or kill the intruder. Staying at range and avoiding close combat skirmishes is the key to victory with Northstar. Legion is a slow hyper aggressive titan that uses his superior fire power to defend and control combat zones. This offensive powerhouse is equipped with a Predator Cannon, which can fire short and long range ammo variations. The long range mode boosts the minigun accuracy, but reduces the damage, while the short range mode boosts damage at the cost of accuracy. Pilots are required to make quick decisions based on their observations and choose the mode that best suits the current situation. Having to switch modes mid-fight can greatly impact the outcome, so always try to think ahead. Deploy your Gun Shield to absorb incoming fire and lay down a constant hail of bullets to ensure you’re always dealing damage, even when on the defence. Use your Power Shot to to deal extra damage and shred through enemy particle walls before shredding steal with your Predator Cannon. Power Shot is also incredibly useful for quickly taking out a doomed titans before an enemy pilot even has the chance to hit the eject button. However, it’s Legion’s Core that makes him an absolute beast on the battlefield. Smart Core allows Legion to locks on to all enemy targets and provides him with infinite ammo. The ability is best used when you’re nice and close to an enemy and have a clear line of sight. This will allow you to give chase and stop any pesky pilots from escaping the Predator Cannon’s clutches. Legion is without a doubt one of the most powerful titans in the entire game. Ion is largely considered to be the “jack of all trades” class by the community, as she’s capable of dealing with both titans and enemy pilots. Her primary weapon is the Splitter Rifle which fires rapid energy shots in a target location. However, you’re best off using her Laser Shot as your primary source of damage, as it’s both safer to use and deals a lot more damage. Charge up the laser and aim for titans across the map, as this will allow you safely land your shots without leaving yourself open to incoming attacks. Ion’s Vortex Shield is particularly effective in both one-on-one combat, and can be absolutely devastating when fighting in larger battles. Being able to absorb enemy fire and redirect it back is one of the most satisfying things in Titanfall 2, especially when you destroy a titan with their own bullets. Just remember to place your Tripwire around corners to damage and deter any titans from flanking your position. Once you’ve built up enough energy it’s time to unleash your Laser Core. Ion’s Laser Core unleashes a huge laser beam from her chest that devastates everything in its path. It’s extremely effective at clearing out tricky objectives as well as defending against multiple titans, but be aware that mobile titans like Ronin and Northstar can easily avoid the blast. In most cases it’s often best to direct this damage toward tankier titans that would otherwise prove difficult to deal with. Tone is easily the most used titan in the game due to her effectiveness at medium to long range combat. She doesn’t have any glaring weaknesses when compared to the other titan classes, while her kit makes her extremely easy to use. Tone is generally considered to be overpowered and can even wreak havoc when piloted by a complete novice. Her 40mm cannon delivers huge amounts of damage no matter the range, and its AoE blast effect makes it ridiculously easy to kill pilots with. If you manage to land three hits on a titan with the 40mm you’ll be able to use her Tracker Rockets. The Tracker Rockets will follow the marked titan and shred through their armour. Use your Sonar Lock to reveal hidden enemies in the area and establish a partial lock on nearby titans. A good strategy is to land two hits with your 40mm, back off around cover, then use Tone's Sonar Lock ability to reward you with the last tracking point. This will allow you to fire your rockets around the corner or into the air, hitting the enemy with an unexpected barrage they won’t be able to dodge. Remember to use your Particle Wall to get free shots on the enemy and launch a few Tracker Rockets to deal some huge damage without losing a scratch of health. Once you’ve blown both titan and pilot apart, you’ll unlock Tone’s Salvo Core. Salvo Core can doom a titan within seconds and is great way to take down a newly piloted titan. Simply watch the pilot to enter their titan, wait for their defensive barrier to drop and launch a non-stop barrage of missiles their way. This will remove about 2-3 bars of a Titan’s health and can instantly take out many of the more fragile titans.